I’ve not been feeling very well the last couple of days. Not the kind of ill where you’re confined to your bed, but rather the kind where you’re eternally restless but without the energy to do anything about it. This kind of sickness is horrific to the creative mind, I look around my house and instead of thinking ‘I’m not feeling great, that pile of washing will just have to wait’ or ‘never mind that huge stack of books my boys have left in the corner, I’ll tackle it tomorrow’ I instead find myself with an almost uncontrollable urge to tidy, sort and throw things away!! Or make wonderful piles of clutter which are destined either for the charity shop, bin, recycling, or to be sold. Do you love decluttering too or is that just me? 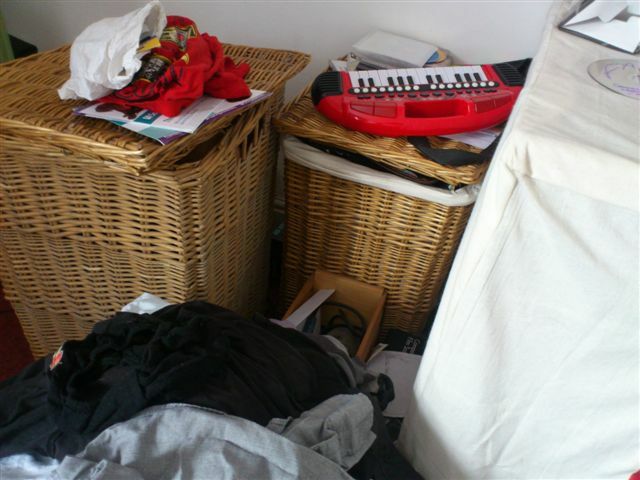 This entry was posted in Miscellaneous and tagged clean, Declutter, organise, spring clean, tidy. Bookmark the permalink. I love to declutter, unfortunately I usually get rid of somethin, having hung on to it for ages and then find I have a use for it ! Abi………. that’s really a fabulous post. I found your post really helpful. But one thing that I would like to add that one can also use self storage facilities which will also help in decluttering as they put your stuff in these units and by this you will have a less stuff to manage and organized which is easy. But beyond this I found your tips are helpful in decluttering. Thanks for making this post informative. Devoting few minutes a day, every day, to cleaning your clutter is the first step in a process that will produce amazing results.Donating is not only a great way to declutter, it is also a great way to give back to all those who need them.